What was your reaction when Rueben got signed to the Redskins? When he got signed, I was, I can't believe somebody picked him up. We had an incident in October. I couldn't believe somebody picked him up in less than how many hours? I was shocked. 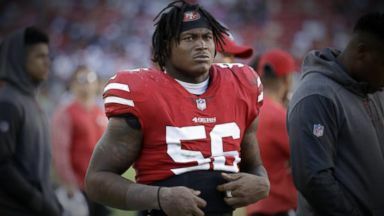 Reporter: Elisa ennis, the former girlfriend of NFL star Reuben foster, now speaking out for the first time since foster was signed to the Washington Redskins. They're tone deaf. The issue of domestic violence is so serious. Reporter: Sparking fresh debate over domestic violence and the NFL. You could assault somebody, you know, the NFL will let you in. 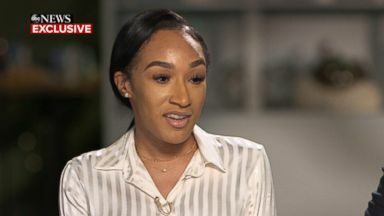 Reporter: In an exclusive interview with ABC news, ennis details what she says was a history of abuse, going public a week after foster was cut by the San Francisco 49ers. Your ex-boyfriend did what? Took my phone and broke it and slapped me in my face. Reporter: Last month ennis called 911 from the San Francisco 49ers team hotel before their game against the Tampa bay buccaneers. What happened last month that caused him to get arrested on vember 24th? He invited me to come see him in Florida. And I came. And he took one of my phones, and he slapped me and pushed me. How did you respond? I was like, I can't believe you've been doing this. Because we were seeing a therapist and stuff, trying to work on our relationship. Reporter: After the incident foster was arrested and placed on the NFL commissioner's excel list, making him ineligible to practice or play until the league completes its own investigation. We decided to make the move. And we'll deal with the outcry. Reporter: The Washington Redskins decided to pick him up days later. We accept, obviously, the questions. But we want to let the process play out and see what happens and get to the bottom of it. 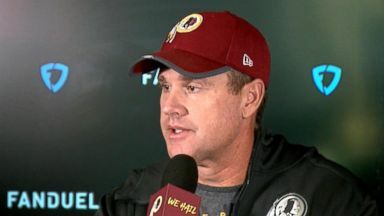 Reporter: A spokesperson for the Washington Redskins told us the team conducted their own investigation. Law enforcement needs to hear both sides of the story and the team will see how this plays out. So many times, especially when you talk about domestic violence as it intersects with sports, victims' claims aren't heard loud enough until you actually see what has happened and hear their voices. Reporter: But the decision is raising questions about just how seriously the NFL takes accusations of assault and domestic abuse. The question for the NFL, what are you doing to find out the full story? Because if you're not finding out the full story, you're going to have a situation like this where miss ennis comes forward and shares something publicly that shows, I think in many people's eyes, that victims aren't being put first. Reporter: Earlier this year in February, ennis accused foster of battery, but later recanted her story and dropped the allegations. Today she's asserting there was, in fact, a history of abuse. What happened in February, Rueben threw my clothes off the balcony, threw my stuff out of the house, he dragged me down the stairs two, three times. He punched me in my face two, three times. Pulled me by my hair, kicked me, spit on me. You go to court, and then you recant your story? Yes, ma'am. Why did you do that? Because I loved him. And love will have you doing things that's not in your best interests. Reporter: Foster is the latest in a long line of NFL players accused of domestic violence. The most notorious, ray rice of the Baltimore ravens. This 2014 video obtained by TMZ sports showed rice dragging his then-fiancee's limp body out of an elevator. He was indicted on aggravated assault charges. The very next day he and palmer married. I failed miserably but I wouldn't call myself a failure because I'm working my way back up. Reporter: The NFL initially gave rice what many considered a slap on the wrist, a two-game suspension. Then, later, a second video emerged, also obtained by TMZ sports, showing rice punching palmer in the face in that elevator. The ravens terminated their running back's contract and the NFL suspended him indefinitely. I got it wrong in the handling of the ray rice matter. And I'm sorry for that. Reporter: Rice entered an intervention program for first-time offenders and his charges were dismissed. The case sparked a national outcry and ushered in sweeping changes to the NFL's policy, including independent investigative powers and a minimum six-game suspension for first-time domestic violence offenders. We thought that the NFL had been doing a lot to address the very serious issue of domestic violence after ray rice. I think we found out that the NFL is not doing nearly enough. Reporter: Another recent incident of violence off the field, NFL star Kareem hunt. The headline that has the NFL back in the spotlight -- Reporter: He was released from the Kansas City chiefs after TMZ sports released video of an incident that happened evidently they are year at a Cleveland hotel. Hunt is seeing arguing with a woman, then shoving her. She hits hunt. Later hunt is seen kicking her. Hunt and friends say they first met the woman, Abigail, that night. Witnesses told police she called the group a racial slur after she was asked to leave. I was assaulted by a player on the 23rd floor. He shoved me, he pushed me -- Reporter: The former Kansas City chiefs running back sat down exclusively with ESPN to apologize once the video surfaced. It don't really matter what happened. I was in the wrong. Reporter: Local police were called to the scene but did not file charges or make any arrests. The NFL claimed they began their own investigation into the incident immediately, but hunt says they never spoke to him. Has the NFL ever questioned you about that? No, they have not. Clearly whatever the NFL is doing is not working. You've got two horrible incidents back to back. And this has been just a double-barrel shot at the NFL that really calls into question everything they have done. Reporter: In coming forward with her story, some have questioned the credibility of ennis' claims. I did what I had to do for the person I love. I thought that he would change. Anybody in my position, they would have done the same thing, you know, if they shared a family with this person. I thought we were a family. Like I trusted him. Like I believed in him. Like I supported him. He's crying, telling me he didn't have anybody. If somebody that you love said they didn't have anybody, you'd do the same thing too. Like that's why I did what I did, because I loved him. Do you still love him? I've been getting help and stuff like that. This is not love. Nobody would do you like that. It's not love. So no. I've been getting help but it's not love. The tears right now are because the relationship is over? Or because of what you've had to endure? It's what I encountered from dealing with him. Like everything I thought was love is really not love. Reporter: It's a reality facing many families across America. I was very much struck and also moved when miss ennis said, I've been getting a lot of help and I realize, this isn't love. Sometimes it can take reaching out for help to realize that the situation that you're in isn't the situation that you have to be in. If you could do it again? What would you change? I would have listened to my mom and my brother and my friends. They told me, don't do it. Don't do what? Don't recant. They knew what I was going through. They knew everything. So I would have never done it. Reporter: For "Nightline," linsey Davis in New York.